Hello 2017! As the new year begins, many people take the opportunity to start a new habit. Here are 5 common resolutions and how you can achieve them here in Milledgeville. One of the most popular New Year’s resolutions is to eat healthier and cut back on fast food. If you are in the beautiful town of Milledgeville, you are in the right place to start achieving your goals. We have two amazing farmer’s markets right downtown that give shoppers the opportunities to buy farm fresh food like homemade bread and jams, and veggies and fruits. 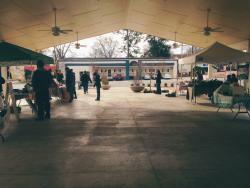 The Green Market is every other Saturday from 9:00 a.m. to 12:00 p.m. The downtown Farmer’s Market is every Tuesday from 2:00-6:00 p.m. April through October, and both markets are at the pavilion right past downtown. 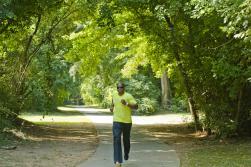 If you are looking to ease into a workout routine that you can continue through the year, Milledgeville has some amazing options that are fun and healthy. One of our favorite places to get fit is Good Karma yoga studio, where you can try yoga classes from beginner to advanced, as well as more unique classes like Vinyasa Flow. Another great yoga studio in Milledgeville is Harmony Hot Yoga, where you can try something new like aerial yoga. If yoga isn’t for you, no worries! Milledgeville is known for its awesome biking trails through historic locations and our beautiful southern oak trees. Becoming the “outdoorsy” type is easy in Milledgeville. 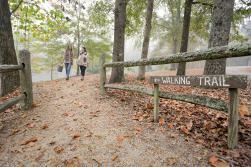 If you are craving some fresh air and beautiful scenery this year, check out any of our famous outdoor locations like the Oconee River Greenway, which features walking trails, Bartram Forest, which has the best hammock trees, and Andalusia Farm, former home of Flannery O’Connor. Having fun for free is no problem in Milledgeville, if your resolution has you pinching pennies. A ton of Milly’s attractions are totally free, like the walking tour through the historic Memory Hill Cemetery, Old Governor’s Mansion tours for students and self guided tours of Lockerly Arboretum. These locations make an awesome weekend trip for families, without breaking the bank. Traveling is on many people’s to-do lists for the new year. If you can’t take a ton of time off work, or are worried about pricey airline tickets, Milledgeville is just a two-hour drive from Atlanta, and makes for a fun and educational trip. 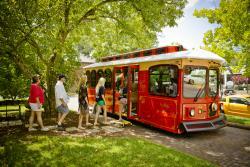 Once you get here, make sure to visit the Milledgeville Visitor’s Bureau and hop aboard the Trolley Tour for a historic overview and tour of our fantastic town.